Why have I asked this? It’s a simple answer really. I wanted to make people who are interested in woodworking to consider an alternative possibility as many thousands following my blog do. Looking back at the above image, try to wrap your mind around the fact that, yes, these spindles could be turned on the lathe but they could just as easily also be made without one. Look at these legs and tell yourself they were made with a spokeshave, a card scraper and an axe. Then add in a drawknife, a Stanley number 4 smoothing plane and a handsaw. What about a brace and bit or two, a nickel, a penny or an old shilling piece. Doesn’t that just blow your mind just a little bit. 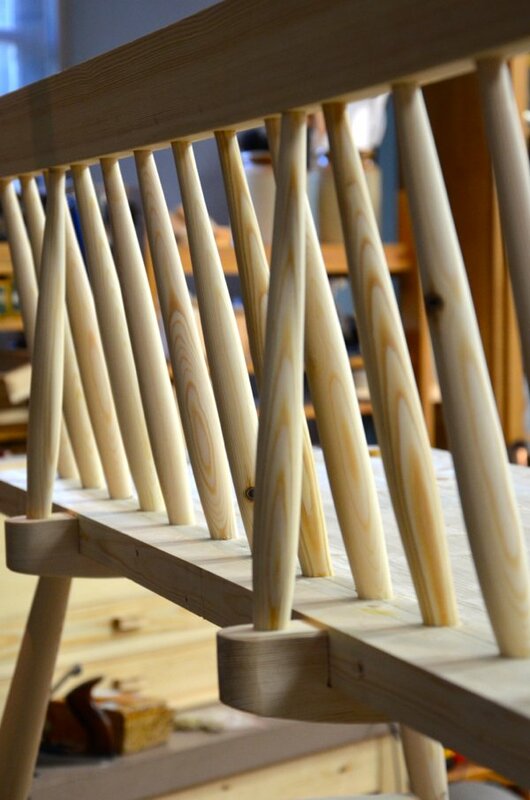 Rounding legs and rails and spindles with beautiful rounded tapered shapes is a process we will be teaching for the first time through a new woodworking masterclasses series that begins in about five weeks. In this instructional there are no machines needed, not one. Here is my most recent work using these techniques and they have never been shown anywhere before. 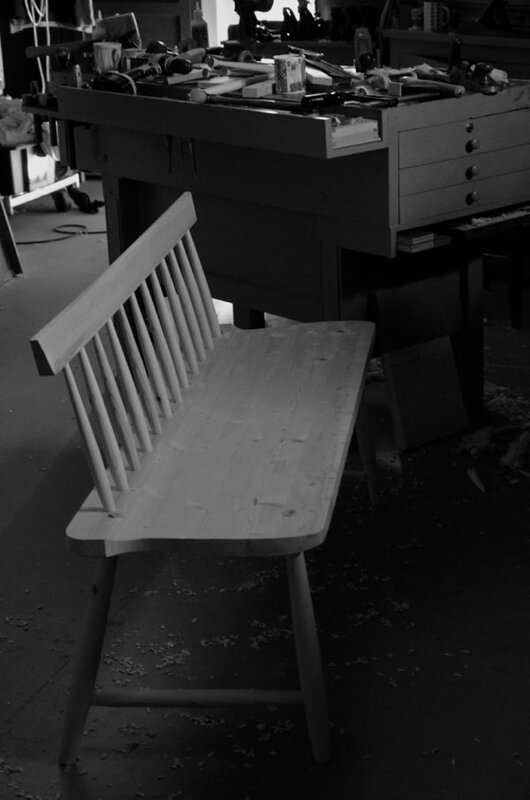 The design follows an ever-popular traditional Shaker style but all the sizing, shaping, angles and all other details are developed completely by me as my own personal design and my contribution to the future of real woodworking. 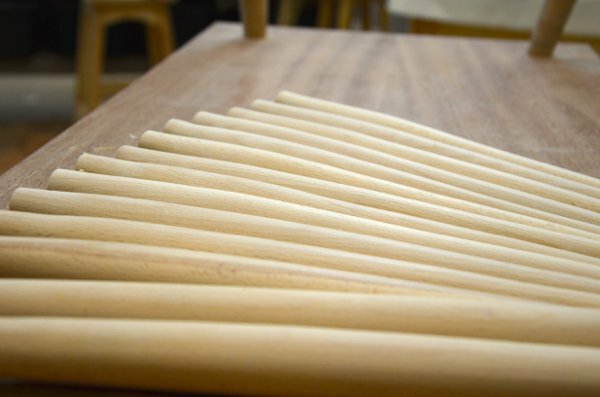 The techniques and the methods used can be applied toWindsor chairs, any of the Clissett-style chairs, Welsh stick chairs and so many more including even many chairs that defy being turned on the lathe. I was excited developing this project and the curriculum for video teaching and I am excited to put it together for one of my new books and DVD instructionals as a how-to for release in the not too distant future. The thing I have worked on for three decades now is a process that tangibly deindustrializes the commerce of working wood in the private lives of individuals and small businesses as a lifestyle alternative that’s viable, vibrant and progressive. It’s not old fashioned or outdated but intensely fascinating for those who love working with their hands and want to become masters of skill through determination, hard work and self discipline. To take my craft and all that I have learned and used for five decades has become an exhaustive work but now, gradually, it is becoming available to anyone anywhere regardless of background, gender or financial status. Learning these methods puts the skills in the hands of parents to teach their children, grandparents and friends and relations and it means that children at an early age can be involved in woodworking again as in times past instead of being left outside the machine shop door. Its a way that woodworking can truly return to being woodcraft again and a way that gives the greatest levels of fulfilment ever. Paul, thank you for helping us woodworkers, for your enthusiasm and for your energy. Hi Paul, very interesting. I look forward to following your project’s development. I’m a big fan of drawknife and spokeshave, so will be interested to see how you put it all together. I admit, the use of an odd shilling has me guessing! Thanks so much for your willingess to share your knowledge. Thought spindles were turned. I was disappointed to find out they were not. I love turning and would be interested and seeing sharpening techniques and turned projects like pulls and kitchen gadgets. The bench looks amazing though. Sorry to disappoint you. I may well do a video on turning in the future but I wanted something that was machine free for training and to show what we can do completely by hand. I am so looking forward to this class. There are so many projects I would have liked to take on except for a majority of the work requiring a lathe. I have read many woodworking magazines, books and blogs over the last 8 years on how to approach such projects without a lathe and never have I seen published anywhere a solution using only hand tools. One other topic that I would like to learn from you is that of lumber selection, considering grain in layout and your approach to glue-ups. While these topics are covered frequently in other woodworking publications and the like, I feel my woodworking would benefit greatly if I could gain an understanding of your approach to such matters. If you have covered these topics previously somewhere else, my apologies. I have learned so much from you and am so grateful you share your knowledge so generously. Looking forward to learning the next steps you have in mind to share.